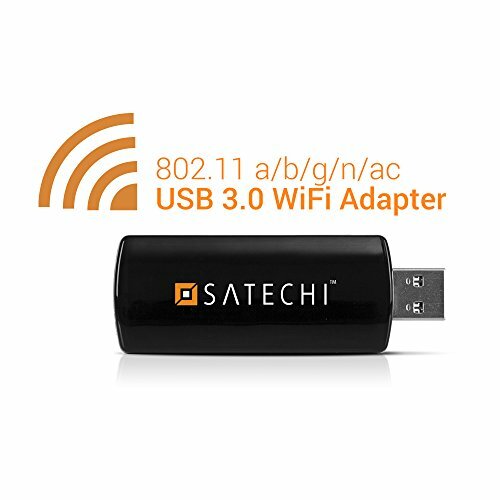 The Satechi Wireless Mini USB 3.0 Wifi Adapter is the perfect solution to upgrading your computer's wireless networking speed. Supporting speeds up to 867 Mbps at 5 Ghz and 300 Mbps at 2.4 Ghz, even your older computer can enjoy the full potential of your wireless network. Fast wireless speeds don't need to be a hassle. With the Satechi Wifi Adapter, all you need for setup is to install the drivers and plug the dongle into an available USB port in your computer. With its small profile, the Satechi Wifi Adapter is perfect for travel or quickly moving from one computer to another. Upgrade your network connection on your compatible Windows XP/Vista/7/8/8.1/10 for smoother internet surfing, video streaming, online gaming, etc. Improve your computer's wireless networking speed!